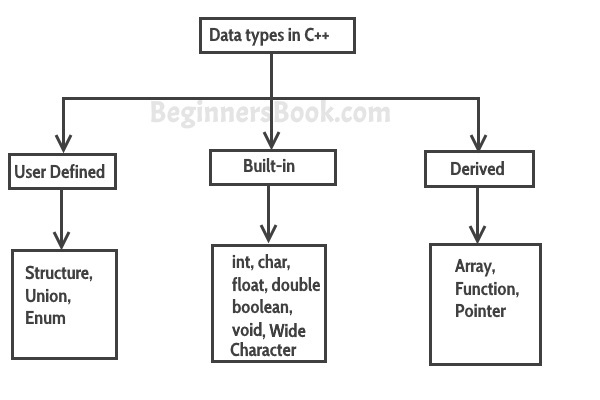 Data types define the type of data a variable can hold, for example an integer variable can hold integer data, a character type variable can hold character data etc. char: For characters. Size 1 byte. int: For integers. Size 2 bytes. float: For single precision floating point. Size 4 bytes. double: For double precision floating point. Size 8 bytes. bool: For booleans, true or false. wchar_t: Wide Character. This should be avoided because its size is implementation defined and not reliable. I have covered them in detail in separate tutorials. For now just remember that these comes under user-defined data types. They are wide topics of C++ and I have covered them in separate tutorials. Just follow the tutorials in given sequence and you would be fine.